Where there is a will there is a way and we are finding many companies out there that are combining the latest audio/visual technology with shooting. 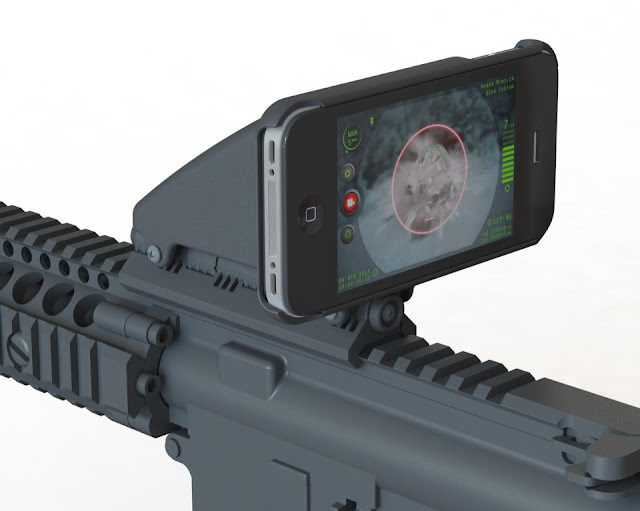 The latest innovation we came across comes from Inteliscopes, which is offering a Rail Mount and App for various iPhone platforms that allow you to convert your phone into a scope. While there are probably several reasons you can think of off the top of your head as to why this is a bad idea, we are sure plenty of Apple fanboys want to combine their love of iPhone with their weekend range visit. Inteliscope is a fairly simple concept with a removable iPhone Cover holding your phone in place on a standard Picatinny or Weaver rail compatible mount. The App promises to feature customized reticle, 5X Zoom, Video Recording, Ballistics and Firearm Data, Compass, GPS, Local Winds, Shot Timer, Flaslight, and Strobe. Intelliscope also points out that their mount with iPhone in place will allow you to observe and shoot around corners, which is reminiscent of the Israeli developed Corner Shot, but we are certainly curious as to how effective this platform may be for that capability.